Urban exploration (also known as urbex) has risen in popularity as a result of recent television shows such as Urban Explorers on the Discovery Channel. This popularity has led to "Urbex Photography" which visually documents these often unseen urban areas, abandoned buildings and industrial complexes. I have always wanted to shoot some urbex but it wasn't until I attended Denise Ippolito's workshop in Philadelphia that I was able to. For those unfamiliar with Denise, she is a talented photographer and leads many different photography workshops each year. Denise's work can be found at A Creative Adventure. The first stop for the workshop was Philadelphia's Graffiti Underground located on an abandoned loading pier jutting out into the Delaware River. It is just a few minutes from the center of the city off of Route 95. The underground is pretty big and is covered with graffiti. It also looks like it has been used extensively by paintballers. 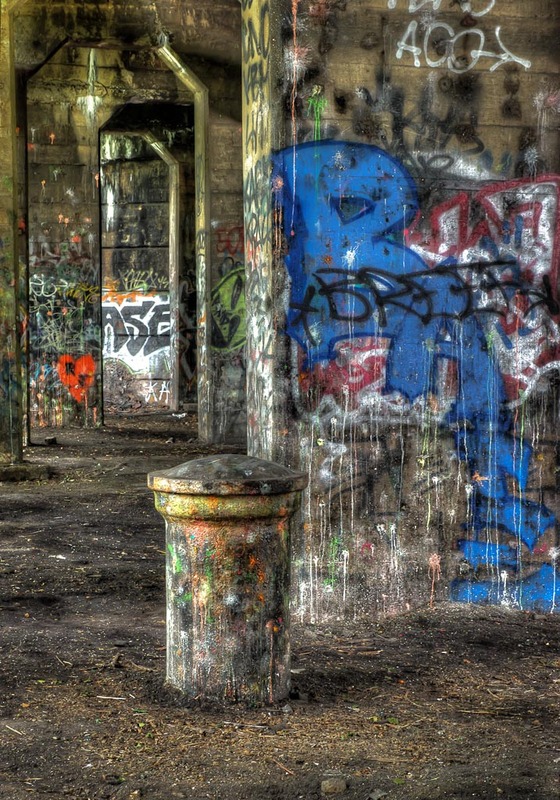 The grit and decay associated with urbex can be seen at the underground as well as the great colors of the graffiti.